Apple and Dulce de Leche Pastries Recipe - Let the Baking Begin! After making the Pear & Nutella Pastries last week, I still had some apples sitting in my fruit basket, so I decided to implement a similar idea but this time I was going to use the extra can of dulce de leche I had on hand. 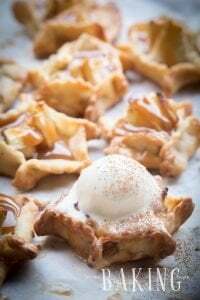 This puff pastry dessert comes together pretty quickly and tastes phenomenal! Give it a try! I hate to toot my own horn, but the puff pastry apple pastries came out so crazy good, that I just wanted to sit down and eat the whole tray. The only thing that stopped me was my conciseness couple pairs of eyes staring at me and waiting for me to be done with taking pictures. If there’s ever a recipe that I would really really want you to try, this one is it. I just know that you will be very much blown away by how good the apple and dulce de leche is in these pastries. Try to choose the firm kind of apple varieties, that would keep their shape when baked. Granny Smith’s or Gala work wonderfully in this recipe. 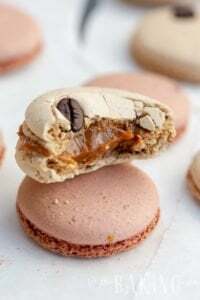 For the dulce de leche, you can make your own by cooking sweetened condensed milk poured into glass jars and sealed, then placing it into the pot with enough water to cover the jars by 1-2 inches and simmering it for 1.5 – 2 hours over low-medium heat. Cool before using. Use a round cookie cutter that’s slightly bigger than the apple half. I used a 4 inch round cookie cutout for a 3 1/2 inch round apple half. That will leave me with 1/4 inch border of puff pastry around the apple. Cut out as many circles as you can from the puff pastry sheet. I got about 10. Do this while the puff pastry is still partially frozen, otherwise it will be very hard to cut out neat circles. Transfer the puff pastry cutouts to a parchment lined baking sheet, leaving about 1 inch of space between them. Fill each apple half (keeping the slices together) with dulce de leche. 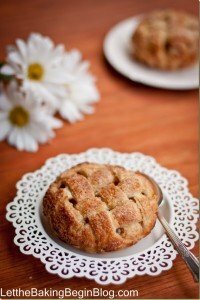 If the apple half is too big for your puff pastry circles, remove a couple of slices from the middle to make the apple fit on the circle, with a 1/4 inch border around the apple. Invert the filled apple onto the puff pastry circle filled side down. Brush on warmed apricot jam. Sprinkle with granola. Bake loosely covered with foil in a preheated to 400F oven for 25 minutes, then without the foil for another 15-20 minutes until the sides are well puffed up and golden in color. If the granola burns before the edges of the puff pastry brown up, place back the foil and continue baking until the puff pastry is golden in color. Once out of the oven allow to cool to room temperature. Take 2 tablespoons of hot heavy whipping cream and mix with 2-3 tablespoons of dulce de leche. Stir until smooth (run through a fine sieve if you want it to be even smoother). Fill a ziplock bag with dulce de leche, snip the corner of the ziplock and drizzle in a zig-zag motion each pastry. Generously dust with powdered sugar and serve within 2-3 hours for best results. Cheesecake Danish Recipe – Puff pastry dessert that’s filled with sweet cheesecake filling. Apricot Almond Pastries – Quick and easy dessert. 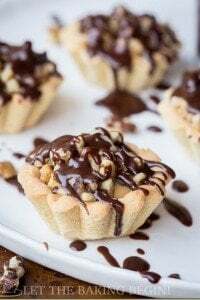 Poached Pears & Nutella Pastries – Pastries with Nutella and pears. Invert the filled apple onto the puff pastry circle filled side down. Brush on warmed apricot jam. Sprinkle with granola. Bake loosely covered with foil in a preheated to 400F oven for 25 minutes, then without the foil for another 15-20 minutes until the sides are well puffed up and golden in color. If the granola burns before the edges of the puff pastry brown up, place back the foil and continue baking until the puff pastry is golden in color. 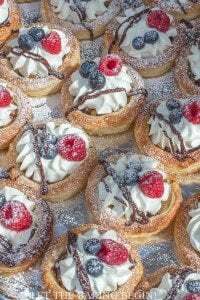 Puff Pastry Berries & Cream Tarts - Let the Baking Begin! Oh dear, my cup of tea! Thank you ! These sound and look so delicious! It’s Fall baking at it’s best. This is mouthwatering! Im giving this a try! Love all the ingredients in this recipe. All you need is some french vanilla ice cream, yum! Yes, that would be great, wouldn’t it!